It's no secret that I adore Monti, the ancient rione a stone's throw from Rome's Colosseum and forum. Want to find out why? Pick up the April issue of National Geographic Traveler (that's the U.S. version of the magazine), where I've written about some of the area's hidden gems and hottest spots—from an ancient basilica to an artisanal gelateria. Here's a sneak peek, but when the article goes live online, I'll share it here, so check back. (Update, March 17: You can now read the story about Monti online!). And stay tuned for news of an article on another fantastic Rome neighborhood, for another great travel magazine, coming soon. (What can I say, I hate to play favorites). As we approach 2012’s end, I was pretty curious about which blog posts were the most popular on Revealed Rome this year. A little stats-checking proved to me that my readers are (unsurprisingly) big fans of Rome, especially when it comes to food, Christmas, shopping, and more! Without further ado, here’s the list of the 12 most popular Revealed Rome posts in 2012… a couple of which surprised me! Do any surprise you? 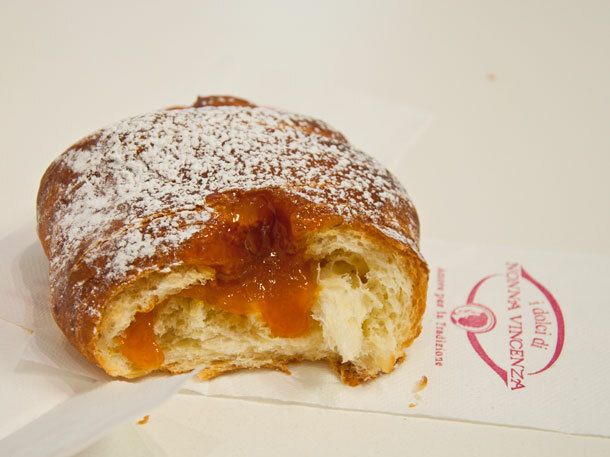 #12: 5 Favorite Places for Food Near the Vatican: Oh lists, how I love thee. This one, on where to grab lunch in the food desert touristy area around the Vatican, was one of my first (semi-regular) “Five for Friday” posts—and one of the most popular. #11: Rome’s Best Shopping Streets: Via del Boschetto: It’s no secret that I’m a big fan of Rome’s shopping… when it’s done far, far away from chain-store-choked Via del Corso. One great alternative is this little street in Monti, near the Roman forum, which is chock-a-block with fantastic artisans and boutiques. 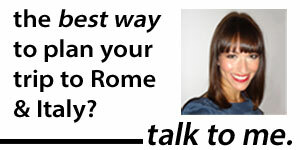 #10: How Safe is Rome, Really? : A question readers found even more pertinent in 2012 than in 2011 or 2010, when it was first published. Not sure what that says about Rome’s reputation. Or about crime in the world in general. Looking for a gift for someone who loves food—especially Italian food? Then do them, and me, a favor: Don't get them a gift certificate to the Olive Garden or a gift basket of random, made-in-the-U.S. products that reflect little to nothing of Italian food culture. These days, there's no reason to. Thank modern technology. Even if you're not in Italy, you can buy authentic, Italian foods—including cheeses, meats, pastas, coffees, and more—that make fantastic gifts for foodies and Italophiles alike. Whether you're looking for a stocking stuffer, a single present, or some items to put together your own gift basket, here are some Italian food gift ideas to get you started. (This is the first of a series of holiday gift guides I'll be publishing!). Of Italy's many kinds of Christmas cakes, panettone the most famous. Originally from Milan, it's studded with raisins and candied fruit peels. Although it's best to get it fresh from a local baker, you can get it online if you have to. 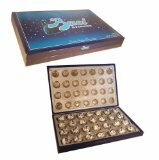 Baci chocolates are so well-known in Italy, "Baci" is a common gelato flavor. And no wonder: They're a blend of milk chocolate and ground hazelnutes (dubbed gianduia), crowned with a hazelnut and covered in dark chocolate. In other words… I'm not sure there's a chocolate lover in the world who wouldn't want to see this box under their tree. Unless they were allergic to nuts. The Italian spread Nutella has become a worldwide sensation, and with reason: This creamy, hazelnut-and-chocolate spread goes on, well, almost anything. Including your finger, straight out of the jar. Top off the topping with The Unofficial Guide to Nutella, a fun, easy-to-read, and recipe-filled book by my friends Sara Rosso and Michelle Fabio. 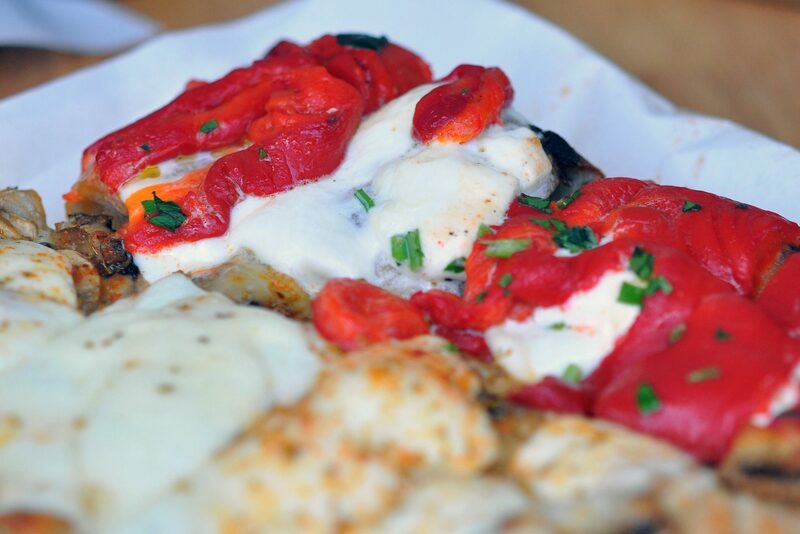 As any "foodie" knows, great food starts with great ingredients. And few staples are more important, whether you're cooking "Italian" or not, than a great olive oil or balsamic vinegar. Frankly, I don't like to cook. But if I just drizzle a little bit of a top-notch, extra-virgin olive oil (more on what that is in a moment) on pasta or a salad, somehow, I feel like I'm eating food whipped up by Mario Batali himself. 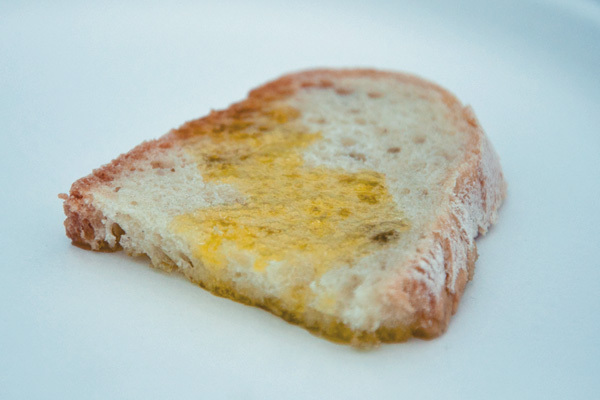 So, when it comes to olive oil, choose your oil carefully. Extra-virgin is a must, but that's not enough, since fraud is rampant in the olive oil industry. Seventy percent of extra-virgin olive oils sold worldwide aren't extra-virgin, in fact, but are cut with lower-grade oils. Some trustworthy places to buy olive oil include the selection of Italian, imported oils at Zingerman's or the Corti Brothers (who also, by the way, have some other amazing-looking, authentic Italian food products). My favorite extra-virgin olive oil, though, is produced by my friend Alina at Fontanaro, an organic agriturismo on the Tuscan-Umbrian border run by Alina and her mother. Their oil is rated as among the best in Italy by guides like Gambero Rosso and Slow Food; it's also organic, delicious, and can be shipped anywhere in the world. And the prices couldn't be more fair. Email alina@fontanaro.it for more info, or check out Cleo's Fine Oils and Vinegars, which sometimes has Fontanaro's oils in stock. (And yes: This is the olive oil I have on my counter right now). Pick your balsamic vinegar of Modena carefully, as well; you always want to make sure it has the "D.O.P." label, which means that it was, in fact, created in Modena, using the right grapes, the right process, and meeting the right quality standards. (In the U.S., we can call anything "balsamic vinegar of Modena," even if it never touched Italy). The award-winning Vigna Oro Balsamic Vinegar di Modena DOP is a good bet. Do right by the caffeine-lovers in your life. If you can't make it to Sant'Eustachio, the best spot for coffee in Rome, in person to scoop up some blends as a gift, you're still in luck: They now have blends available online. Pick from whole beans or ground coffee. And to really have coffee the Italian way, don't forget the espresso maker. These little contraptions are small, cheap, and long-lasting, and they're an integral part of Italy's coffee culture: I have yet to enter a single Italian kitchen that doesn't have at least one of these sitting on the stove (and no American filter-coffee machine in sight!). Although it seems a little random (you're going to give someone meats and cheeses? really? ), this can be a great gift. A couple of years ago, I made up a basket of cured meats I'd brought from Italy for my stepfather, a real guy's guy; he loved it (and, needless to say, it disappeared quickly). Just remember that it's impossible to get cured meats, like prosciutto, as thinly-sliced as they would be at an Italian butcher. So to go a step beyond, consider giving an electric food slicer to go with that array of meats. If you're not in Italy, and you can't find authentic, Italian meats and salamis at your local butcher (if you want the "real deal," always ask where they're sourced from), then check into ordering online. (As with all of these products, ensure that what you're buying is made in and shipped from Italy and, if applicable, protected by "D.O.P." or "I.G.P." status). Mortadella from Bologna might be where we got our "baloney" from, but yes, the real deal is a completely different (and tastier) story. For a less-known meat, speck from Alto Adige is a lightly-smoked, dry-cured ham from the Tyrolean region of Italy . My favorite, though—and this is something that's in my kitchen here in Rome right now—is the delicious standby, prosciutto di Parma. For cheese-lovers, an array of some of Italy's best cheeses can't go wrong. Some of my favorites include fontina from theValle d'Aosta, Pecorino Romano from Rome, caciotta al tartufo from Umbria, ricotta salata from Sicily, and, of course, the two most famous guys: fresh mozzarella di bufala from Campania (I promise, it's completely different than mozzarella back home) and Parmigiano Reggiano from Parma (also completely unlike that powdery stuff you get in the green cans in U.S. grocery stores). Yum! This book hits shelves tomorrow, but it's already available for pre-order… and looks fantastic. 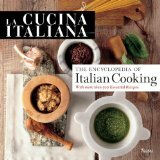 The Encyclopedia of Italian Cooking, published by the editors of La Cucina Italiana magazine, features how-tos for every quintessential Italian cooking technique, from how to shape tortellini to how to recognize a San Marzano tomato. Some 500 recipes are included, too. A great gift for beginners to Italian cooking, or for those who want to brush up on their techniques. 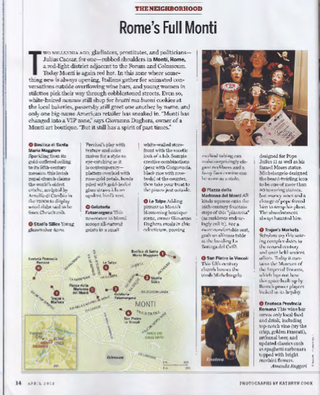 (Another nice gift idea, of course, is a subscription to La Cucina Italiana magazine). Or go for the bible of Italian country cooking. La Cucina: The Regional Cooking of Italy got its start 50 years ago, when Italian scholars gathered to figure out how they could preserve traditional, Italian cooking in the face of so much change. The Italian Academy of Cuisine did research in hundreds of villages, getting recipes right from people cooking in front of their stoves, and gathered these 2,000 recipes, which include arancini di riso from Sicily, buridda (fish stew) from Liguria, and everything in between. For a cookbook of Italian recipes at their most authentic, check out the Essentials of Classic Italian Cooking . Don't expect any spaghetti and meatball recipes here: Instead, there are fantastic treatments of classics like ossobucco, polenta, gnocchi, risotto, and more. I love the idea behind the beautifully-photographed The Italian Farmer's Table: Authentic Recipes and Local Lore from Northern Italy . It gathers 150 recipes taken directly from agriturismi in northern Italy. In other words, it doubles as a cookbook… and as inspiration for anyone planning on visiting northern Italy and wanting ideas of where to go, what to eat, and even what agriturismi to stay in! Pair a bottle of excellent Italian wine with a little background reading for the recipient. One great place for wine-lovers to start is Vino Italiano: The Regional Wines of Italy, which covers Italy's wine-producing regions, identifies their most important wine styles, prodcuers, and vintages, and even includes recipes. Wine Map of Italy is, literally, a map—and any wine-lover will want to have it as a reference at hand, or even tacked to their wall. It includes Italy's DOC, DOCG and IGT wine zones, plus an index booklet. Gambero Rosso's Italian Wines has always been the number-one way to sort out Italy's best vintages, from the rest. The Italian Wines 2012 version is a little different than past ones, but wine enthusiasts will still want to have it on their shelves. How Italian Food Conquered the World is a great look at, well, how Italian food conquered the world—or, more accurately, how it transformed as it moved from Italy into immigrant communities abroad. I've written about the book before. Waverley Root's The Food of Italy is a classic; each chapter covers a different Italian region, with basics about the area's food culture and its most popular dishes. Probably the most fun of all of these reads, Delizia! : The Epic History of the Italians and Their Food is a well-written, fast-paced history of Italy—told through its food, from Renaissance banqueting halls to 19th-century Naples alleyways. Olive oil's history isn't just thousands of years long… it's also full of scandal—perhaps not so surprising in an industry that has as much money in it as hard drugs (!). This book, Extra Virginity: The Sublime and Scandalous World of Olive Oil , started as a New Yorker article, and it's on my bookshelf Kindle as we speak. 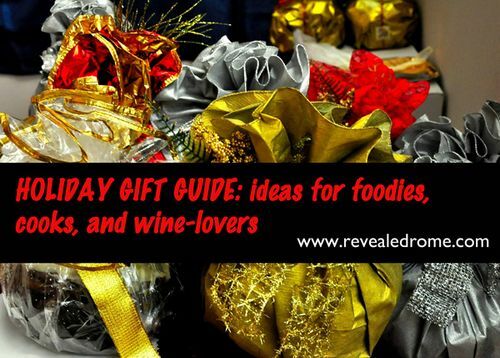 Liked this gift guide? Then make sure to check out the other ones I'll be posting soon! Don't grab a cornetto (Italy's answer to the croissant) at just any old cafe. (Lots of them are bought, frozen, in bulk—ew!). Check out my guide for where to find the best cornetti in Rome for Serious Eats. I just finished a must-read for any lover of Italian, or Italian-American, food: How Italian Food Conquered the World , by John Mariani. A thoughtful gift from my mother, the book explores how Italian food went from being completely unremarked-on by 19th-century travelers… to a global phenomenon. Here were five of the most interesting facts I found. Thanks to sharecropping, a farmer gave most of what he grew to the landowner. Hardly any of his land was left for grapes—plus, the vines had to compete with other crops for nutrients. 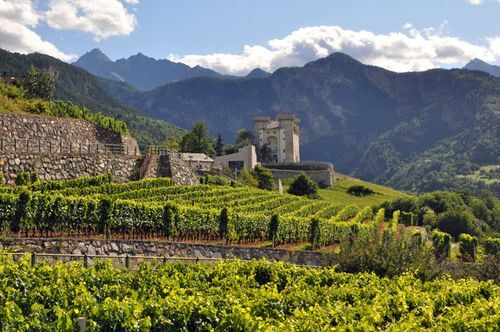 "There simply was very little demand for fine wine in Italy for most of the 20th century, and the destruction of land wrought by two world wars only made prospects dimmer," Mariani writes. Of course, things changed—but later than I'd realized. In the 1970s, Lucio Caputo, the Italian Trade Commissioner in New York, pushed the American media to discover Italian wines, and pushed Italian wine-makers to improve their product. Only in the 1980s did most winemakers start using smaller, 59-gallon barrels instead of the 264-gallon guys (having seen it first in California!). They also started switching over from the wooden barrels they'd used for decades, which oxidized the wine. 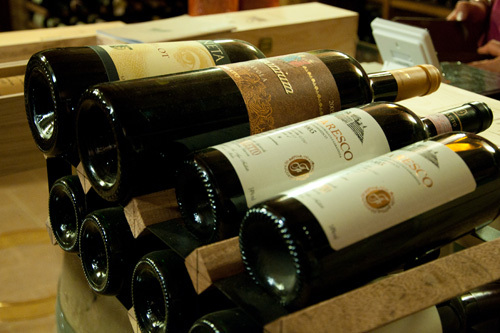 In 1970, Italian wines represented just 18.4 percent of the U.S. import market. By 1980, they constituted 55 percent. Crazy, right? Although "Italian recipes" showed up in some American cookbooks, they were generally Italian-American, if that. One "Italian" entry in the 1971 New York Times International Cook Book: "veal roast with frankfurters." Even France's "gastronomic bible"—Larousse Gastronomique—included a paltry section of Italian dishes in its 1961 translation. (And that section included some real travesties. Like that macaroni should be boiled for 15-20 minutes and should be dressed with nutmeg, Gruyere and Parmesan cheese). All of that changed, or started to, only in 1973, when Emilia-Romagnan immigrant Marcella Pollini wrote The Classic Italian Cook Book. For the first time, mainstream America was introduced to the traditional principles of authentic Italian cooking. Pollini, for example, "insisted on using good olive oil—not readily available then—buying fresh ingredients in season, making homemade broth, and using the best Parmigiano-Reggiano… She also reminds readers that Italians always enjoy two courses at a meal, but neither need to be large in proportion, the way Italian-American dishes so often were." 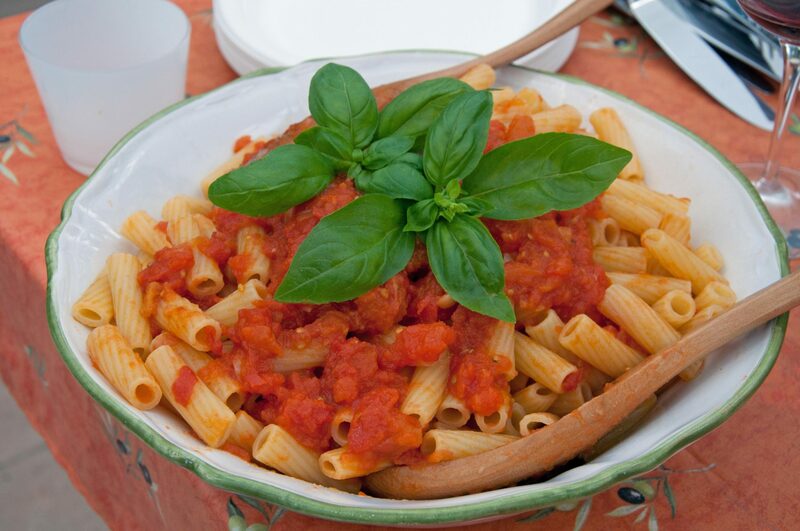 marinara sauce: This sauce wasn't even included in a book of Italian cooking compiled by the Accademia Italiana della Cucina in 2009. Somehow, though, it gained traction as a pop-culture reference in America by the 1930s. pasta primavera: Made with a stomach-turning mixture of pine nuts, tomatoes, string beans, frozen peas, and broccoli, this dish was invented by the wife of the owner of Le Cirque, who tossed it together to feed a couple of guests during a trip to Canada. Le Cirque's owner refused to make it in the restaurant, saying it would "contaminate" the kitchen. penne alla vodka: I forgot this existed until reading this book. "The vodka, of course, had no flavor at all, so it was usually marinated with chile peppers and blended with tomato and cream," Mariani notes wryly. Not Italian. veal alla valdostana: A huge veal chop, stuffed with prosciutto and Fontina cheese, and doused in mushroom sauce. 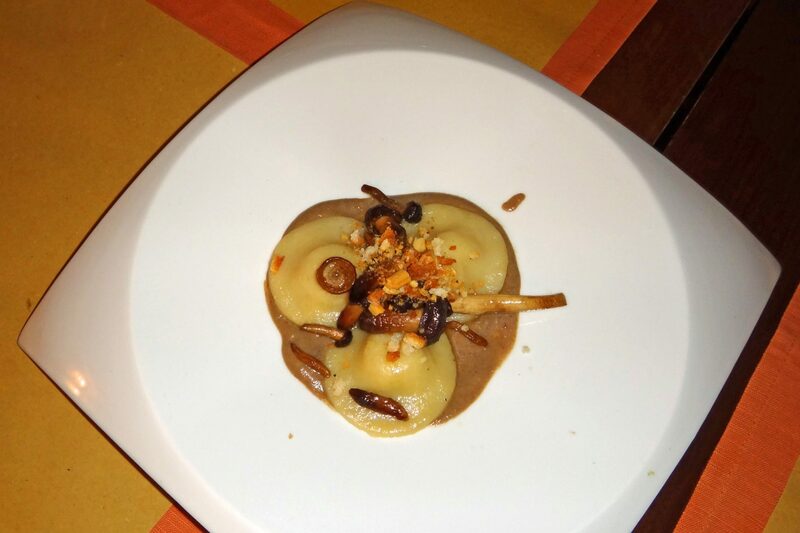 I spent 2 months living in the Valle d'Aosta this winter, and I can safely say I never saw this dish. 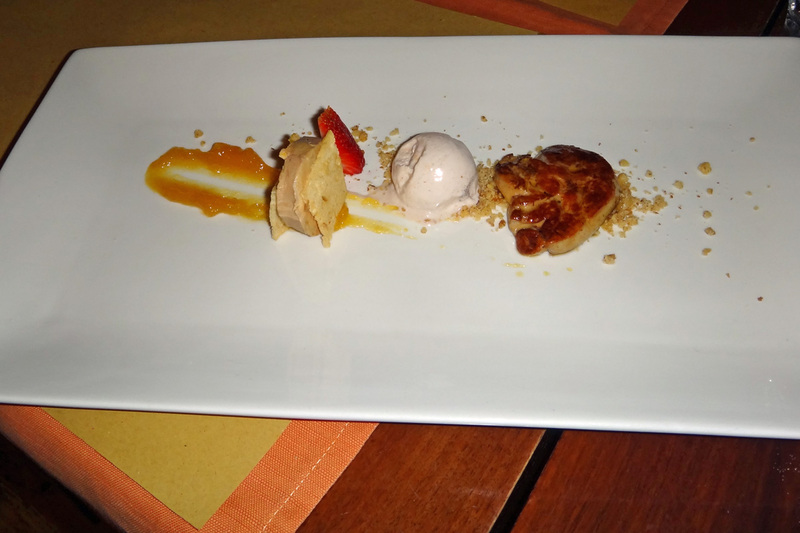 tiramisu: This one surprised me, because I do see it on menus at (non-touristy) Italian restaurants today. And, okay, technically it was invented in Italy: It was first created at a restaurant in Treviso in the 1960s. But it remained virtually unknown throughout Italy all the way until the 1990s. When the Italians caught on to the fact that was wildly popular at restaurants in the U.S. …and added it to their own menus. In 1984, FedEx started its first routes to Europe. DHL soon followed. This was huge. As one Italian restaurateur had moaned in 1983, "most Italian ristoratori lose sleep trying to import the best possible items from Italy. 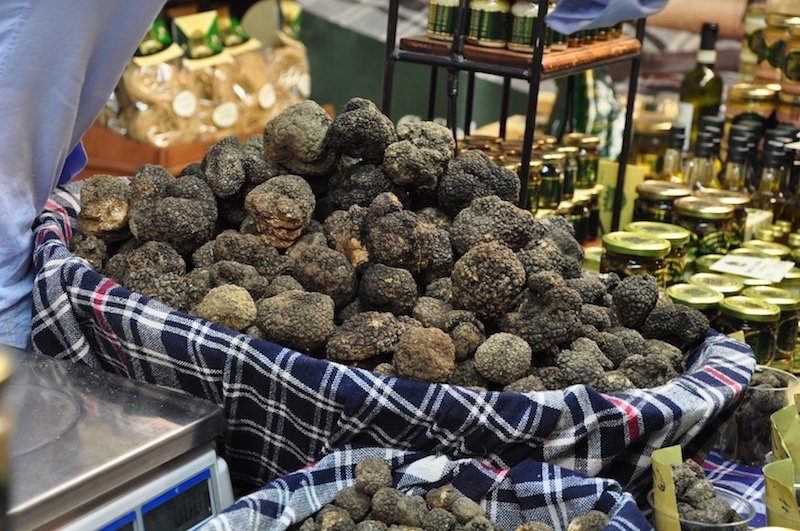 To talk to us about truffles when we pay $400 a pound and when they arrive, 50 percent must be thrown away because no reliable freight service can guarantee delivery from Italy in two days? We buy French fish or black truffles because they arrive on time." Now, all of those hard-to-get ingredients could be delivered within 24 hours. But it didn't solve everything. Tony May, on the board of the Culinary Institute of America, said that despite FedEx and DHL, a region's great local products didn't wind up abroad. You still had to visit Italy to find proper, regional cooking. When Waters opened the famed Chez Panisse in 1971, she rocked the culinary world. Why? Because her approach was different: begin with good ingredients. It seems obvious now, but it wasn't then. Cooks at every kind of restaurant in America, including Italian restaurants, "wanted the same ingredients, in or out of season, every day of the year, even if they were packaged, frozen, or canned," Mariani says. In the meantime, tourists to Italy were fascinated by the street markets there, where the fish had been caught that morning, the beef was grass-fed, and the vegetables in season. And la nouvelle cuisine was getting trendy. Proponents "encouraged innovation but, more important, asked cooks to consider the health and nutrition of their patrons, shorten cooking times, avoid unnecessary complication, learn techniques, use the finest and freshest ingredients, and return to regional cooking. Taken together, these guidelines were already in force in kitchens throughout Italy." Ta-da! An Italian food revolution. Bonus fun fact: Did you know the USDA keeps Italian meets out of the US? 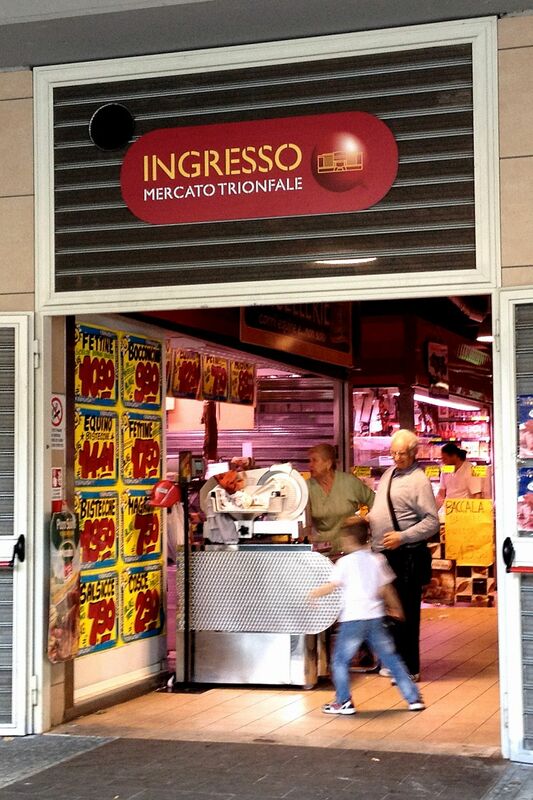 Prosciutto in Emilia-Romagna—not allowed into the U.S. until 1989! 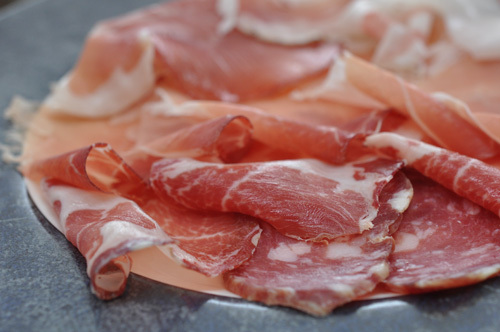 Prosciutto was banned for export to the U.S. until 1989. Mortadella and Speck were outlawed until 2000. Other meats, including cotechino and zampone, are still banned today. The reason? "Ostensibly to protect American livestock from trichinosis and hoof-and-mouth disease, but primarily to protect U.S. pork producers from competition," Mariani writes. Want more tips about eating (and more) in the Eternal City? Check out The Revealed Rome Handbook: Tips and Tricks for Exploring the Eternal City, now available for purchase on Amazon, below, or through my site here! 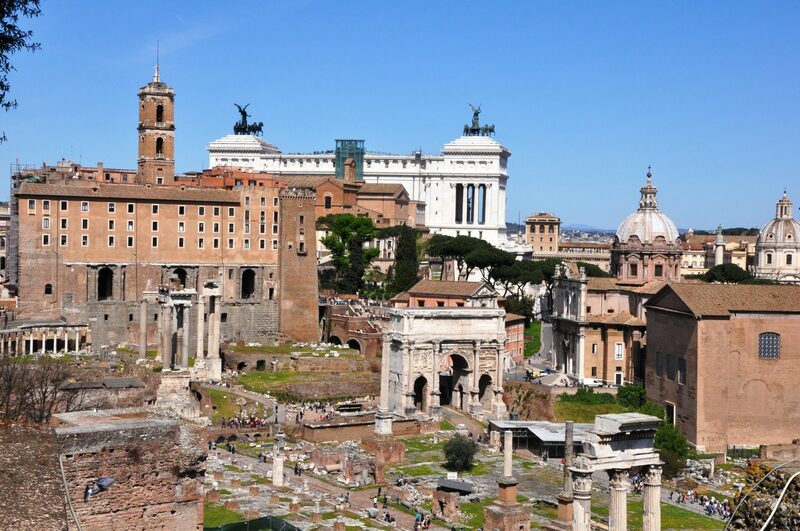 How Should I Schedule My Sightseeing in Rome? Not everything’s open every day in Rome. The Vatican museums and Sistine Chapel close one day a week; so do lots of favorite restaurants and shops. So when planning your trip to Rome, it pays to have a basic idea of what day in the week is best for which sight or activity. Here’s help. (In the form of a “rhyme.” Move aside, Shakespeare Keats Dr. Seuss Eddie Mannix). And here it is… in video form! You’ll also be out of luck if you were hoping to see the School of Athens. 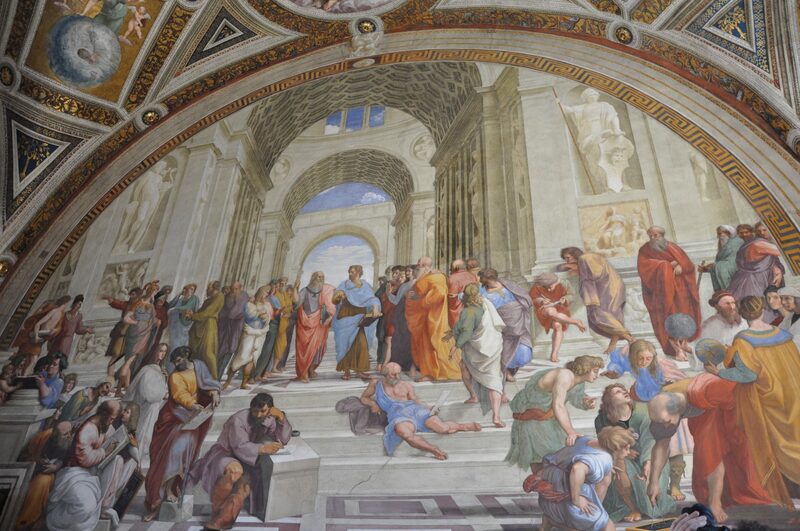 The Vatican museums (which include the Sistine Chapel) are open every day but Sunday. On the last Sunday of the month, they are open and free, but it’s not something I recommend if you value your vacation time; the line is often three hours or more (and you can’t book a ticket in advance on the Vatican website). St. Peter’s Basilica is open daily; on Sunday, the Pope appears at 12pm to an audience on the square, and on Wednesday, he has his general audience at 10:30am. Best time to go to the Vatican: Wednesday morning, as the museums tend to be emptier while the Pope does his audience; otherwise, Tuesdays, Thursdays or Fridays, since Saturday and Monday tend to be crowded with people who would have gone on Sunday. Most churches are open daily in Rome. However, many of the more off-the-beaten-path churches also close midday, some for as long as from 12pm to 4pm, so always check. On Sunday, remember that they may be holding Mass and more ceremonies than usual, which can make it more difficult (or forbidden) to walk around to sightsee. Best time to go: Morning or evening, except for Sundays (unless you want to see Mass). 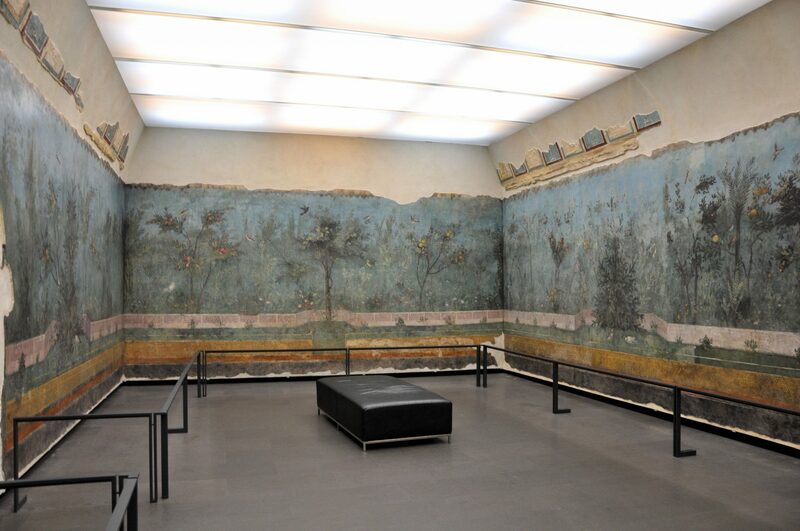 Most of Rome’s best museums close on Mondays, but are open every other day of the week. These include the Borghese Gallery, Palazzo Barberini, Palazzo Massimo, Crypta Balbi, MAXXI, Castel Sant’Angelo, and the National Gallery of Modern Art. Best time to go: Tuesday through Friday; weekends tend to be more crowded than weekdays (not that that’s much of a problem at some of these places, like the Crypta Balbi). 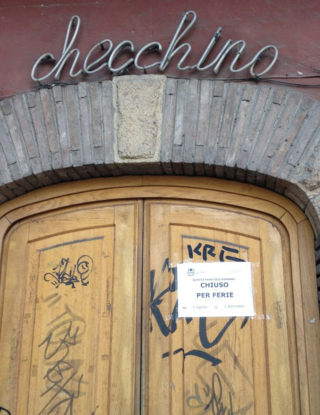 Many of Rome’s restaurants have one “day of rest,” even though this is no longer government-mandated. This day is typically—but not always—Monday, and sometimes Sunday for lunch and/or dinner as well (particularly for restaurants that are more elegant or upscale; since Sunday is a big pizza night, pizzerias are usually open Sunday). 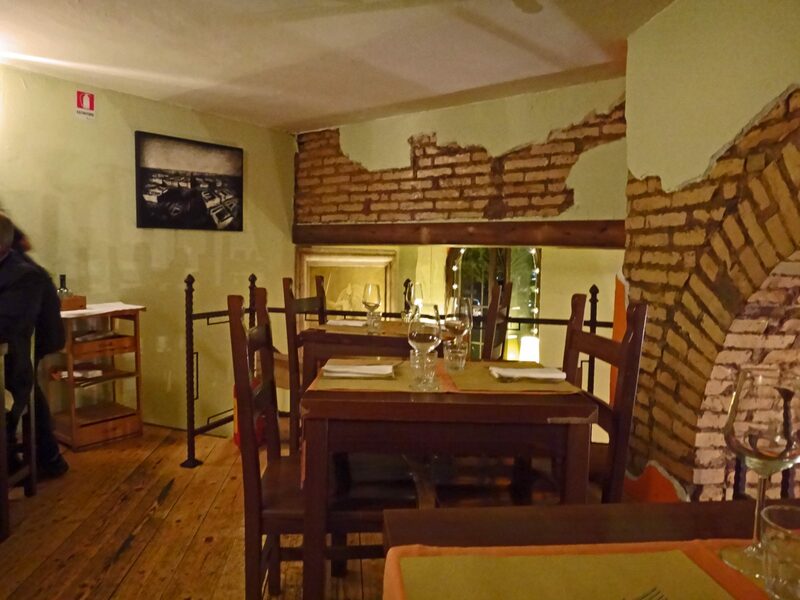 Some restaurants, like popular Da Francesco near Piazza Navona, close Tuesday instead. Best time to show up without a reservation or calling in advance: Wednesday or Thursday. Popular places tend to have a wait on Friday or Saturday nights, and if you’re heading somewhere on a Monday, you’ll want to call in advance (or look it up) to make sure they’re open. Luckily, no matter what day you’re planning on going, at least one catacomb will be open. Just make sure it’s the right one! The catacombs of St. Sebastian close on Sunday, Santa Priscilla closes Monday, St. Domitilla closes Tuesday, and St. Callixtus closes Wednesday. They also close on most major holidays and over the lunch hour, so double-check the hours on the websites. Best time to go to the catacombs: When they’re open—and not on the weekend, which tends to be more crowded. 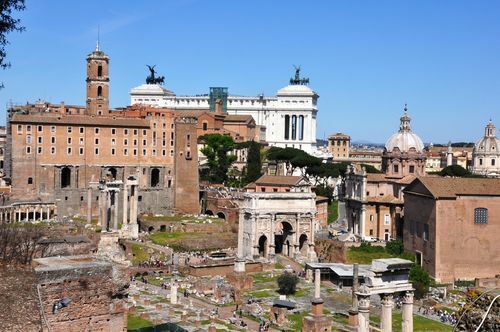 Most of Rome’s most famous ancient sights are open daily, including the Colosseum, forum, Palatine, and Pantheon (although the Pantheon does close slightly earlier on Sundays, at 6pm rather than 7:30pm). The Baths of Caracalla also open daily (but close at 2pm on Mondays). 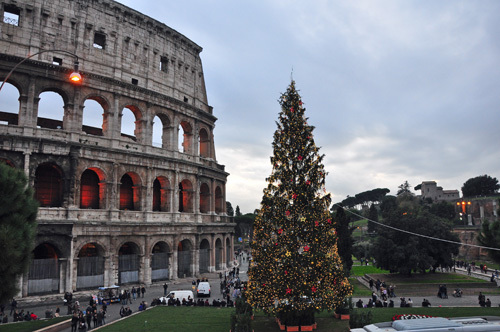 Best time to go: Anytime—although to avoid lines and crowds at the Colosseum and forum, opt to either be there first thing in the morning (i.e. 8:30am), or later in the day (many people clear out by 3pm). Shops in the heart of Rome’s center—particularly on Via del Corso, around Piazza Navona, and near major sights—are open every day. Especially the chains. (But we know how I feel about those). More interesting and better Smaller shops, which don’t have the staff to open daily, tend to close one day a week; for many, this is Sunday. Lots of them stay closed through Monday morning. Many of the smaller stores also close midday, like churches. Best time to go shopping: Monday through Saturday, outside of lunchtime; to avoid shopping crowds in high-trafficked areas, try not to shop in the evening or on weekends. 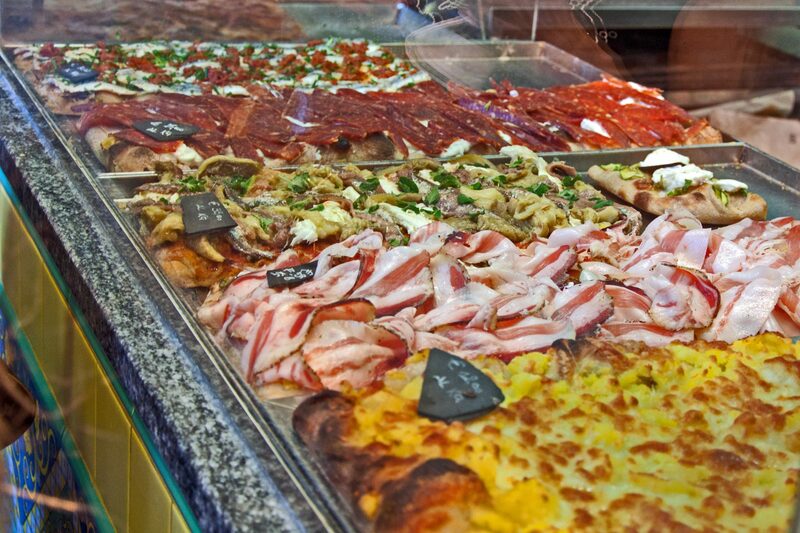 Wondering where to eat near the Vatican… especially when you need something fast? Don’t flop down at one of the osterie you see just outside the Vatican walls—I don’t care how pushy nice the host trying to lure you inside seems to be. And don’t (please, don’t!) go to the Subway that’s opened up in the area. Look: There are tons of terrible food options in this touristy area. Your mission, if you choose to accept it, is to avoid them. Here are the five best spots to have lunch on the go—in the shadow of St. Peter’s Basilica and the Vatican Museums. (All are within a 10-minute walk of one sight or the other, if not both). 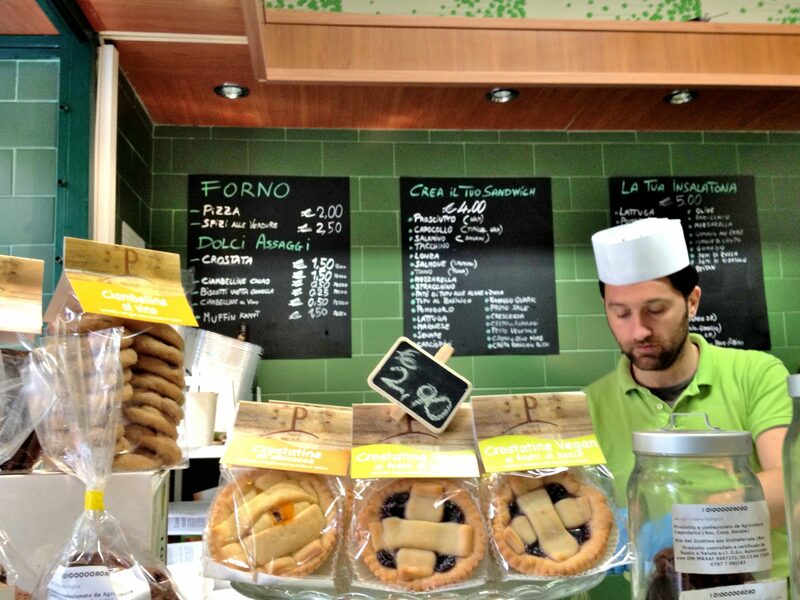 If a steady diet of pasta and pizza has left you craving a soup, salad, sandwich, or smoothie, then head to this hole-in-the-wall around the corner from the Vatican museums. Grab a quinoa or a pasta salad (€5-€5.50), or have a sandwich or salad made fresh from the long list of ingredients to choose from, including lots of vegetarian-friendly options. No matter how many ingredients, sandwiches are €4 and salads are €5, making this one of the best deals in town. (P.S. : My love for Fa-Bio and its super-fresh, organic ingredients runs so deep, I’ve even put them in the Fodor’s Rome 2012 edition, on sale from September!). Via Germanico 43, a 6-minute walk from the Vatican museums entrance/exit and a 10-minute walk from St. Peter’s Basilica. Although Duecento Gradi has gotten pretty popular since its opening right at Piazza Risorgimento, the prices—starting at €4.50 for a huge panino—remain fair, and the ingredients pretty good. Make your own panino from a long list of toppings including fontina cheese, artichoke sauce, spicy salami, and more, or pick from the list of suggested creations. Salads are available, too, and for everything, you can either grab a table, eat at the counter, or take it to go. Piazza del Risorgimento 3, a 5-minute walk from the Vatican museums entrance/exit or from St. Peter’s Basilica. The best pizza you can eat near the Vatican, hands down, is served up at famed pizza chef Gabriele Bonci’s Pizzarium. Located right at the Cipro metro station, this foodie haven is renowned for its perfectly chewy dough (thicker than the classic, thin-crust Roman pizzas), high-quality ingredients, and creative concoctions. Can’t choose between the classic buffalo mozzarella and tomato, or something like the taleggio with zucchini and sesame? Have both: You always tell the guy behind the counter how much you want and you’re charged by weight, so you can try a bit of everything. Via della Meloria 43, a 7-minute walk from the Vatican museums entrance/exit and a 15-minute walk from St. Peter’s Basilica. 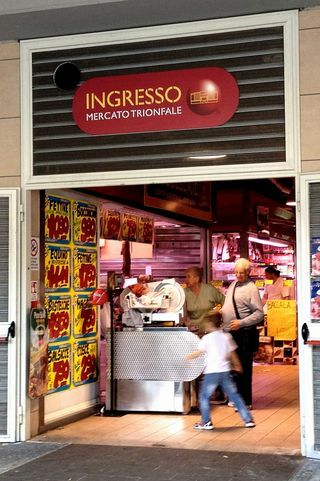 Since its 1925 opening, this market has been a Prati institution. 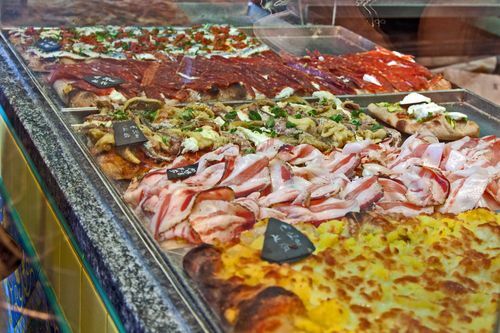 As well as meats, cheeses, oils, and other Italian delicacies you’ll be tempted to buy up and bring back home, Franchi has a number of good tavola calda options—suppli and arancini, fried baccala, porchetta, even roast chicken or lasagna. Eat at the counter, or take your goodies to go. This is a popular place, so don’t be afraid to be aggressive firm to get your order taken over the crowded lunch hour. Via Cola di Rienzo 24, a 12-minute walk from the Vatican museums entrance/exit and a 9-minute walk from St. Peter’s Basilica. For something really different—and at authentic as you can get—forgo all of the restaurants in favor of… a food market. 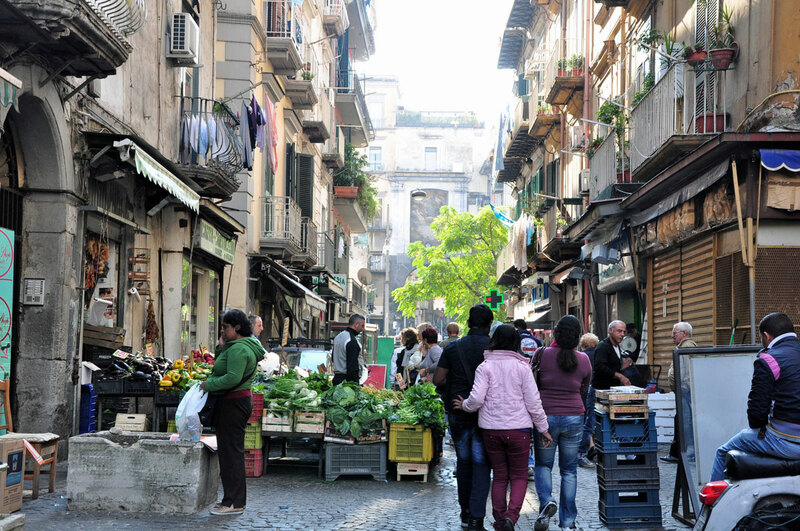 Located a 5-minute walk from the entrance/exit of the Vatican museums, Mercato Trionfale is the main market for the Prati neighborhood and, with some 275 vendors, one of the biggest markets in Italy. Vendors sell it all: fresh fruit and produce, cured meats, cheeses, breads… Grab a few items to make your own picnic to go (mozzarella di bufala? prosciutto? melone? ), or have one of the sellers put a panino together for you (porchetta, perhaps?). Forget spending €12 for a small buffalo mozzarella and prosciutto antipasto at one of the area’s rip-off restaurants; here, that much money will get you the same food, and more. Just remember that the market is open until only 2pm on Wed., Thurs., and Sat. (until 7pm on Tues. and Fri.), and is closed Mon. and Sun. Via Andrea Doria, a 4-minute walk from the Vatican museums entrance/exit and a 14-minute walk from St. Peter’s Basilica. Also: six of the best trattorias in Rome, my favorite new gelato shop and 11 etiquette mistakes you won’t want to make. If you saw a dish like this one (the colors! the presentation!) 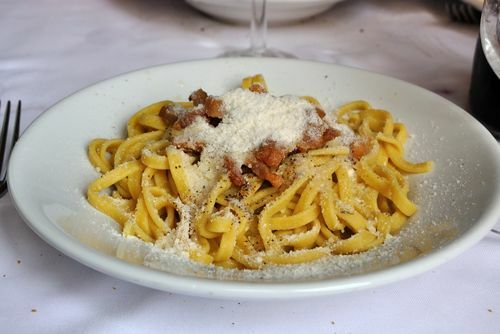 while dining in Rome, you might assume it comes from one of Rome's Best Restaurants—you know, the places where "Best Restaurant" comes in caps, like La Pergola or Il Pagliaccio. At the very least, you might assume a meal at said restaurant would set you back a pretty penny. You'd be even more convinced of this after taking a bite. 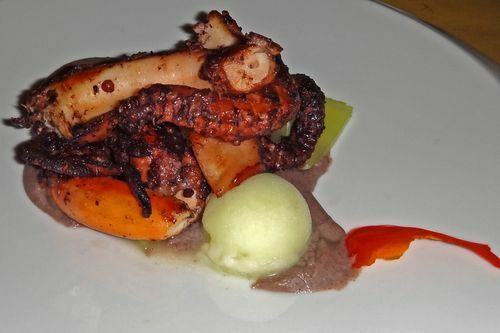 Super-fresh, perfectly roasted octopus on a black bean sauce, adorned with a slice of celery gelatin (yes, really). And that's just the antipasto. But despite the creative dishes and the high-quality ingredients, this is no La Pergola. It's Osteria Fernanda, a restaurant in Trastevere. Perhaps the best restaurant in Trastevere. And the price is a fraction of what you'd spend at Fernanda's Michelin-starred neighbors. 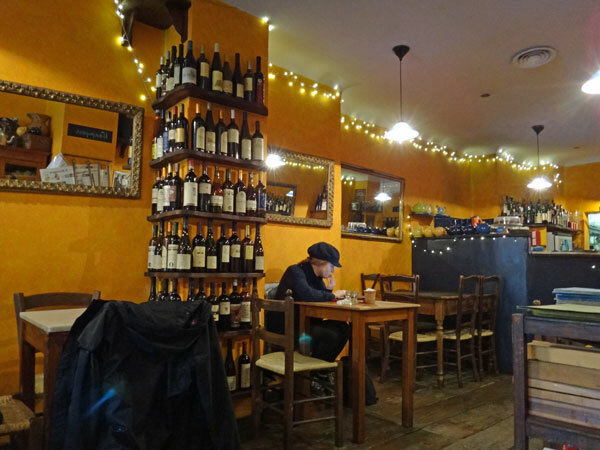 Located near Porta Portese (would you look at that… you can get there on the #3 bus! ), Osteria Fernanda is a small but elegant space, contemporary with just the right "old Rome" touches (brick archways, wooden floors). If you can, reserve a table upstairs (shown above)—the tables downstairs are a little close together. From the start, the service was impeccable. I was there with a visiting Scottish friend and her mother, and speaking with them in English; we were the only English-speakers in the place. But we were treated with the same courtesy and respect as the tables of Italians around us. (After more experiences than I can count, especially in Rome's centro storico, where the polar opposite is true, it's admittedly sad that this is worth mentioning). The owner, who took our orders, was polite, helpful, and, yes, spoke English. But the food is where things really got going. First came a delicious amuse–bouche, one of those little complimentary "extras" that are rare at any but the most expensive Rome restaurants. The antipasti were perfect: the octopus (above) was delicious, although the second antipasto we ordered, an "escalope of foie gras, Szechuan pepper gelato, lemon puree and crushed nuts," blew my mind (below). Hot and cold, melt-in-your-mouth soft and crunchy, meaty and citrusy—everything was there. And it all worked. After setting such a high bar, the primi could have been letdowns. They weren't. Although out of the three dishes were ordered—mine, acqua e farine pasta filled with Roman artichokes on cuttlefish-ink and bottarga, was creative but good—the most traditional was actually, in my opinion, the best. Yep: bucatini all'amatriciana. 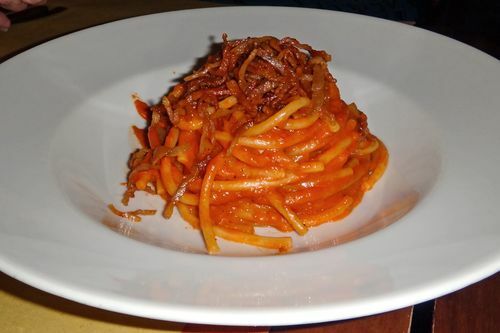 It just might be the best amatriciana I've had in Rome. Ever. Too full for the delicious-looking secondi (next time, I'm going for the beef cheek with artichoke gelatin, Jerusalem artichoke sauce and licorice), we went right for the desserts. Big surprise: They were fantastic, too. And the presentation was lovely. 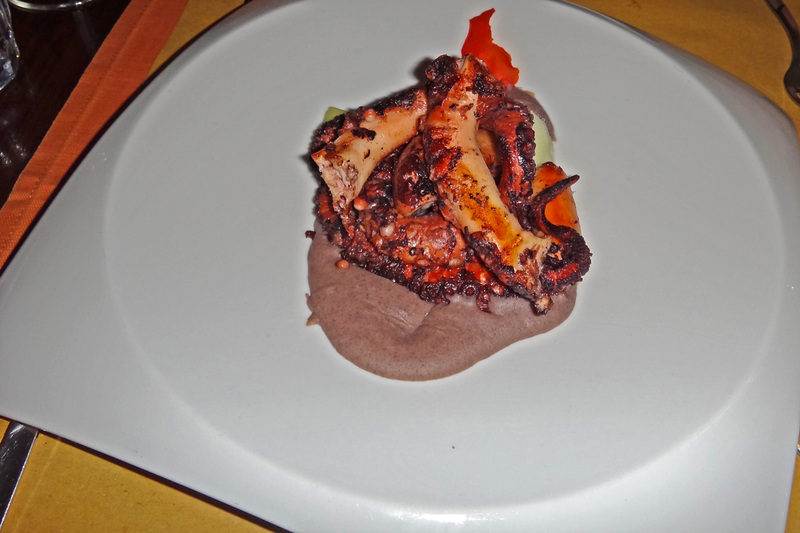 Even though the prices were listed on the menu (our octopus starter was €15, the amatriciana was €14), the bill could have been almost anything. Would they charge us for the amuse–bouche? Assume we were all tourists and take advantage by adding a 15% servizio or an exaggerated pane e coperto charge? And how much were the bottles of wine that the owner had recommended, and that we hadn't double-checked the price on? For two antipasti, three secondi, two dolci, two bottles of wine, bread, and water, the price came out to about €110. Or a little under €40 a head. The wines had been under €15, and, yes, the amuse–bouches were complimentary. Cheap? No. Incredible value? Yes. 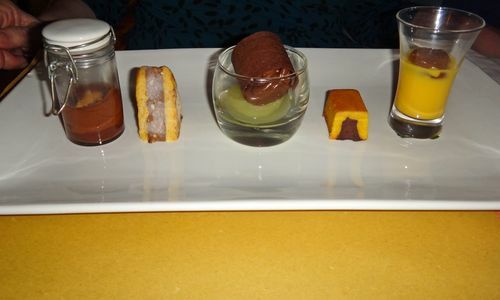 (There also are two tasting menus, one 4-course taster for €33 each and one 5-course taster for €38). And Osteria Fernanda? I'm sure foodie fame is coming your way. And more tourists, too. Just please, please, don't change. Okay? Osteria Fernanda. Via Ettore Rolli 1. +39 065894333.